Everyone has knives in their kitchen, and those knives need constant sharpening to stay at their sharpest and get the job done right. Whether you’re new to the struggle of keeping knives sharp, or you’ve been battling with this issue for a while, you’ve come to the right place. We’ve spent many years researching and trying to find the best kitchen knife sharpener. We’ve tried electric sharpeners, honing rods, and even the best sharpening stones. We’ve tried the best cheap knife sharpeners, as well as professional knife sharpeners. In the end it’s all about the ability to slice, chop and dice with ease in the kitchen and that requires proper knife maintenance and sharpening, which you can read about in depth here. We won’t go into the best practices for keeping knifes sharp, we’ll say that it’s incredibly important for good results from your knifes, especially if you’ve invested in a good knife set, that should last for many, many years with proper care. Half the battle of keeping your knifes sharp is understanding the options and choosing the one that’s right for you. Since there are many different options, it’s difficult to tell you what is the best knife sharpener. This guide will explain the pros and cons of the top knife sharpening options, and we’ll provide a chart of the best rated knife sharpener in each category. To help you find the top knife sharpeners for 2018, we’ve chosen our 8 favorite types of knife sharpeners from the overwhelming amount of kitchen knife sharpeners out there and we’ve listed all the key information from the reviewed knife sharpeners is in the comparison table below. For me, the best test of a knife’s sharpness is how easily if can cut through the skin of a tomato, so that is the test we’ve held each of these products up to. How many times have you tried to cut through a tomato and realized your knives are not as sharp as you need them to be. You won’t have to deal with that problem any more once you’ve read our reviews and decided on the best knife sharpener for you. Each of the blade sharpening tools we’ll discuss here has its own pros and cons. In fact, each user is likely to find their own set of pros and cons with each method. There’s no right way for everyone. You want to look for the method that suits you best, whether it be a manual kitchen knife sharpener, a fully functional professional electric knife sharpener, or a sharpening stone. That said, some methods just produce a better result, thus we will focus on those methods. Type of sharpening mechanism: There are two key factors that you should look for in a manual or electric knife sharpener. First, the type of abrasive properties it has. Carbides can rough up the surface of your knifes and produce inconsistent results. Diamond, however, produces a strong, sharp blade. Sharpeners with diamond abrasive last longer and are of much higher quality. Type of blades it sharpens: You’ll need to know your knives in order to determine the type of sharpener that’s best for you. Most techniques will easily sharpen straight-edge blades, but not all of them can handle angled knives, or 15-degree blades. Even less can handle serated edges or ceramic knives. After you see this extensive lesson on how to sharpen a serrated knife, you’ll probably want to find an electric knife sharpener that can sharpen serrated knives for you! Learning curve: With any new tool or appliance, there will be a learning curve. Whether it’s that you’ve never used that tool before, or that this particular model is more difficult than others you’ve used, those are all considerations to make when deciding on the right kitchen knife sharpener for you. Cleaning requirements: Each method has specific cleaning requirements, and some can certainly be more tedius and time consuming than others. Does it sharpen to your standards: Everyone has a different ideal for how sharp their knifes should be. I perfer to work with only the sharpest blades and I can easily tell when they are dulling. Some knife sharpeners acheive better results than others. If you want the sharpest blade, you’ll likely have to spend more to get it. Space constraints: This is pretty self evident, but if you don’t have a lot of space in your kitchen for extra appliances, a small manual knife sharpener takes up much less space than an electric one does. Along the same lines, a professional electric sharpener will likely take up the most space. Noise: There are a good many cheap knife sharpeners AND expensive ones that make a horrible amount of noise. The amount of noise they make doesn’t necessary relate to how well they’re sharpening, but it might sway you in another direction. Manual sharpeners are generally very easy to learn how to use and they allow for a great degree of control when sharpening your knifes. They also take up considerably less amount of space in your kitchen and don’t produce any loud, obnoxious noises. To use a manual knife sharpener, you pull the blade of your knife through the slot provided and work the blade back and forth along the … Manual sharpeners are generally quite a bit less expensive than electric sharpeners, they are lighter weight, smaller, and can be just as good at producing a sharp edge, when you apply the right pressure. An electric knife sharpener takes the manual labor out of sharpening a knife. Some think they can cause damage to your knives and can do no better in sharpening than using a good old fashioned stone, thus they aren’t a good idea, but if you choose the right electric knife sharpener, they can be a really great helper to many people how don’t want to learn how to use a stone, or just want to simplify the process. Electric knife sharpeners are larger than manual ones and they require the use of electricity, so they aren’t as portable either. But they do the work for you, thus requiring less precision and input on your part. Some kitchen gurus swear by water stones for sharpening, saying they deliver very high quality sharpness, but using them takes a lot of practice and patience, until you’ve mastered the skill. I’ve never really gotten the hang of a wet stone sharpener, and I never really wanted to spend the time learning it properly. That makes me, and many other home cooks, not the perfect candidate for wet stone sharpening. However, if you have the patience and are willing to develop the skill required, it can be very effective and it won’t require buying a really expensive electric machine that itself requires maintenance and could breakdown. We’ve included the honing rod in our reviews because it is an integral part of keeping your knives sharp and the edge straight to enable ease of use in the kitchen. Honing your knives is different from sharpening them. A honing rod should be used in between sharpenings to keep the edge upright and cutting well. If you bought a knife set, it’s likely that it came with a steel honing rod. And it’s also likely that you have been under the impression that this tool is used for sharpening your knives, but it isn’t. Rods are meant to correct the shape of the edge of the blade. Over time, the knife’s edge can roll over, causing it to cut as if the blade is no longer sharp. Rather than needing to be sharpened again, the knife just needs to be honed, to return the edge to its perfectly aligned position. It is for this reason that a honing rod should be used on your knives more frequently than a sharpener. It’s always wise to be fully prepared to make your decision, and getting your questions answered is part of that equation. Below you will find a few of the top questions and answers that are often asked about knife sharpeners. If you’d like to read more, check out our post with the top 10 knife sharpening questions. Question: Why do I need a knife sharpener? Answer: When you first buy a knife, it’s got a perfect angle and sharpness that makes cutting and chopping easy and safe. But over time the blade can begin to bend, chip and become dull. If you don’t regularly hone your knives after use, the edge will become very dull and will no longer cut easily through foods, as it once did. Keeping your knives sharp is important for a number of reasons, the most important of which are to make cutting as easy and fluid as possible, and to prevent accidents caused by dull blades. You can keep a knife in tip top shape for quite some time by regularly using a honing rod on it after every few uses. But eventually you will need to sharpen the knife again. You can have this professionally done, or you can do it yourself at home. Question: Are counter top knife sharpeners actually good for sharpening knives? Answer: There are many different types of knife sharpeners, both electric and manual, so it’s not easy to make a sweeping assumption about all counter top knife sharpeners. There are some that are better than others. Knife sharpeners that are made with the best quality products, and use diamond abrasives are the best and can sharpen your knives fairly well, without removing too much metal. On the other hand, lesser-quality sharpeners can cause significant damage to your knives, and many remove a lot of metal which can more quickly deteriorate the use of the knife. Would I use just any counter top sharpener on my most expensive knives? Absolutely not. But if you have a drawer full of basic kitchen knives, you can certainly sharpen them well with the right sharpener. These type of sharpeners can be a really great helper to many people how don’t want to learn how to use a stone, or just want to simplify the process. Question: Can a knife sharpener damage my knives? Answer: Yes, it is possible for a knife sharpener to damage your knives. This happens most frequently because the sharpener used was of low quality and the abrasives actually strip away too much metal, or are not aligned properly, thus making the edge even more dull in the process. User error is also to blame in many cases. If you are not sure how to operate the knife sharpener, you can damage the blade by running it through the abrasives too many times, with too much pressure, or at a slight angle. It is imperative to buy a high-quality knife sharpener and to fully understand how to use it before attempting to sharpen a knife. Question: How often do I need to sharpen my knives? Answer: Regular honing of your knives is the most important step in keeping your blades up to par. If you hone your knives after every heavy use, or every 2-3 regular uses, it will stay sharp for a very long time. If you are disciplined about this, you may not need to fully sharpen your knives very often, if ever. However, if your dedication falls slack, you may need to sharpen and polish your knife once every 6-8 months. If you never do any honing and are tough on your knives (drop them into the sink, put them in the dish washer, cut through things they shouldn’t be used for, etc) you may need to sharpen ever 3 months. This way of treating your knives will result in the shortest life-span for the knife. Question: Can a knife sharpener be used on ceramic knifes? Answer: Generally, the answer is no. While there are some knife sharpeners that do sharpen ceramic knives, the vast majority do not. You must be very careful to select the correct one. Question: Can a knife sharpener be used on all knives? Answer: Much like the previous answer, the type of knife you can sharpen with a specific sharpener varies greatly. You need to be aware of the types of knives that can be used with a specific sharpener. Some have slots for fishing and hunting knives, pocket knives, all types of kitchen knives, and even scissors. Some only allow for a specific type of metal and/or bevel angle. Question: How long does it take to sharpen a knife with a sharpener? How many times do I pull the knife through the slot? Answer: This answer varies based on how damaged the knife is. If you have a rather heavily damaged knife, you may need to pull it through the course slot 6-8 times, then through the fine slot another 6 times and finally through the polishing slot another 3 times. This will take about 8 minutes to complete. If the knife you’re sharpening is not damaged, just a bit dull, you’d only pull it through the fine slot 3-4 times, and through the polishing slot 3 times. You never want to apply heavy pressure when pull the knife through the slot. 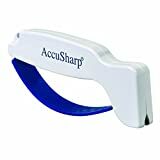 If you’re looking for a really easy to use and store knife sharpener, the AccuSharp 001 is a good choice. Although the abrasive wheels are diamond-honed tungsten carbide, rather than diamond, the AccuSharp produces a fairly sharp edge for your knives without the cost of a higher-end manual or electric sharpener. To use it, you just set your knife on a sturdy surface and run the AccuSharp over the blade with very light pressure. A few passes is all it needs to give new life to dull knives. The AccuSharp isn’t just for kitchen knives. It’s designed to work with all kinds of sporting and outdoor knives, as well as serrated knives. You don’t have to worry about adjusting for the perfect angle. The AccuSharp tool guides the knife through the wheels to sharpen it properly. It can be used both right and left-handed. Another benefit of the AccuSharp is easy cleaning. It can be washed with soap and water, or even put in the dishwasher, so maintenance is a breeze. Plus, it’s a handheld device that takes up very little space in a drawer. Overall, if you’re just looking to achieve a sharp edge quickly, the AccuSharp 001 will work for you. It’s an ultra portable knife sharpener that will get the job done for less. If you’re looking for a quick and budget way to keep your knives sharp, a manual knife sharpener, you may like the Synerky 4-in-1 knife and scissor sharpener. The Synerky is very lightweight and portable, easy to store away in the kitchen, and it works well for sharpening basic kitchen knives and scissors with ease. Synerky also has a value price tag for those who can’t afford to spend a lot on a knife sharpener. This gadget is one of the most economical ways to keep your kitchen knives sharp and ready to use. It isn’t recommended for use with expensive kitchen knives that require a higher degree of precision. The Synerky 4-in-1 knife and scissor sharpener has a sturdy non-slip base and ergonomic handle that’s easy to grasp and hold on to as you sharpen, which is very important for safety. It’s made of a very lightweight material, so it’s easy to move around, and doesn’t take up a lot of space in the kitchen. The sharpening blades come in two different sizes, to enable the sharpening of really dull or damaged blades, as well as to just put a refined edge on non-damaged knife. I ran a damaged knife through the rough slot and was able to get it sharp enough to cut through paper with ease. I also sharpened a very small paring knife in the polishing slot and it too sliced again with ease. The sharpener can be used with many different knives, so it’s quite versatile. The scissor sharpener slot, however, didn’t perform to the level I was expecting. The scissors were sharper, but not enough to cut easily through fabric. 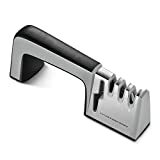 This manual knife sharpener is great for many different uses. Not only is it a fast and impressive way to sharpen your kitchen knives, it works for American, European and Japanese knives, as well as serrated knives and pocket knives. It has a three-stage system with criss-cross technology and 100% diamond abrasive wheels for the strongest, most exact edge. The sharpener also has bevel angle control for 15 and 20 degree edges, so you can be sure you’re getting the tightest grip, thus the best edge. Two of the three slots on the Chef’s Choice 4643 are for sharpening – one for 15-degree angle blades (Japanese knives), the other for 20-degree angles (European/American knives). The third slot is for use with serrated knives and for honing, so you don’t have to use a separate steel honing rod to perfect the blade. There are other models of this sharpener available that will suit your needs better if you only have one type of knife to sharpen. For instance, if you’ll only be sharpening 20-degree angle knives, the Chef’s Choice 465 costs a bit less. Overall, this Chef’s Choice knife sharpener is a great solution for kitchen knife sharpening. It’s light weight, easy to use, and offers the most features for the price. The sharpness you’ll achieve if you follow the Chef’s choices knife sharpener instructions is very good. Without spending quite a bit more for an electric sharpener, this is surely one of the best manual knife sharpeners for 2017. Cook’s Illustrated agrees! Read our full review of this product. The Presto 08800 is a basic, entry-level electric knife sharpener. If you’re new to the world of knife sharpening and looking to give new life to your dull knives, it will do the trick, but don’t expect a perfect edge every time. The Presto uses Sapphirite abrasives to sharpen in the first stage. It then has a second stage for honing. It is designed for standard kitchen knives made of alloy, carbon, or stainless steel, but does not work with Japanese or 15-degree angle knives. And it can sharpen one-edged serrated knives. With the Presto, there’s no guess work. The blade guides lead the knife through each stage to produce the right angle. It will only take a few passes through stage one to achieve a fairly good result, and you may even find that passing it through too many times or using too much pressure can result in a duller result. The honing process is necessary to smooth the final edge. Though it won’t be as razor sharp as with some diamond-abrasive machines, the edge achieved with the Presto 08800 is decent for the price of this electric knife sharpener. If you’re looking for a higher-quality product, the 08810 professional-grade adds an additional stage to the process for fixing up even the dullest or nicked up knives. If you have a lot of high-quality kitchen knives and are looking to convert your 20’degree angled knives into 15-degree angles, the Chef’s Choice 15 Trizor XV is the electric knife sharpener for you. What sets this electric sharpener apart from others is its ability to convert typical 20-degree angled knives into 15-degree edges with precision. The Chef’s Choice 15 can accommodate almost any knife, including American, European and Japanese knives, with both single and double bevel, converting them all to 15-degree edges. It has advanced, patented flexible spring guides to control the sharpening angle, so you don’t have to worry about adjusting it yourself. It produces a burr-free triple-bevel fine edge with its 3-stage EdgeSelect process. The EdgeSelect system gives the user control over the type of edge they want to produce. By using stage 1 and 3, the blade will retain more “bite”, which is better suited for cutting through tougher things like thick-skinned produce. Using all 3 stages will result in a razor-sharp edge. The system can also accommodate serrated knives, small paring knives and pocket knives. Because we know that not everyone wishes to re-edge their knives to a 15-degree angle, we’ve included the Chef’s choice 1520 AngleSelect as an alternative to the Chef’s Choice 15 Trizor XV. The 1520 was designed to sharpen Asian, European and American style knives to either a 15 or a 20 degree angle, depending on your preference. The 1520 uses all diamond abrasives to create an ultra-sharp edge on your knives. It also has patented, flexible stropping and polishing discs that put a “gothic arch” edge on your knives. Read more about the gothic arch edge. The 1520 can also be used to restore damaged blades and can recreate the 15 or 20-degree edge on any knife. Many different knives can be sharpened with this tool, including European/American blades, Japanese and Santuko blades, as well as sports, pocket and outdoor knives. Serrated knives are also supported on this electric knife sharpener. 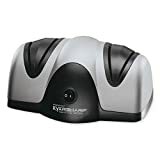 It’s a good choice for a high-end multi-purpose sharpener and is one of the top rated knife sharpeners for 2018. The Chef’s Choice 1520 comes in both white and black models. Read our full review of this product. This Messermeister is made of ceramic which is very smooth. A ceramic rod should be used with most Asian knives that have more delicate blades and thinner edges. The ceramic rod provides a nice smooth finish on the knife’s knewly sharpened edge. Although this particular ceramic sharpener is a 10″ rod, other sizes (including a 8″ and a 12″) are also available. You should purchase a rod that is about the same length or slightly longer than the knives you’ll be using to sharpen it with. This Messermeister rod had an argonimical grip and comes with a lifetime manufacturing warranty. Just be sure not to drop it, because the ceramic could shatter. Most of the sharpening rods that come with knife block sets are steel honing rods with grooves. In most cases, it is preferable to use a smoother steel rod, so it doesn’t scuff up the sharp edge too much. This Wüsthof sharpening steel is made from chromium plated steel with a hardness of 65° Rockwell has a fairly smooth surface so you don’t have to worry much about wearing down the blade. This 10″ steel rod is best used with knives that you’ll be using for tougher foods, like thick-skinned produce and meat, because of the micro-scuffing that will be added by the steel. It has a slip-resistant plastic handle and loop on the end so you can hang it on a hook in the kitchen. Assuming you’ve never used a whetstone to sharpen knives before, you should be aware that it takes practice and knowledge to get the right degree edge on the knife. We recommend watching a video on how to sharpen knives with a whetstone before deciding that this is the method for you. Here is an easy-to-follow video from https://youtu.be/nWJMEWck3WI on YouTube that will show you the basics of how to use a wetstone, like the two-sided sharpening stone we recommend below. Our recommended sharpening stone is a two-sided whetstone from King. It is made in Japan and is a 1000 & 6000 grit combination stone. The 1000 grit side is used to sharpen and smooth the blade, while the 6000-grit side is used for honing the blade. These two grit levels are all you’ll need for sharpening basic kitchen knives. There are other grit levels that should be used for other types of knives, or for knives that are damaged and need restructuring. It comes with a plastic holder to keep the stone in place while sharpening. As you can see from this guide, there are many different choices you need to make when choosing the right knife sharpener for you. Hopefully this guide has helped you narrow down the choices. To recap, these are our favorite manual and electric knife sharpeners. If you still haven’t been able to make a decision, we can narrow it down to these two for you. Looking for the best knife sharpener for your kitchen? Find all the best ones in this guide. Like this post? We would love if you would ping this post on your Pinterest board to share with others. Quite a good review. I find the best and easy conclusive sharpness test is ” will it shave”… simple as that. You can easily cut a tomato with a reasonable amount of sharpness, but shaving, splits the men from the boys. I suppose that’s an appropriate test, Terry! I tried to sharpen a dull knife with the Trizor XV and passed it 20 times thru first slot and the nice still didn’t slice thru paper. Should I throw out the knife? Steve, sometimes knives become too dull to be sharpened this way. You don’t necessarily have to throw it out, but you would probably want to get it professionally sharpened and then keep up on the maintenance yourself afterward with the Trizor.